Sufi Shrines in Asangaon, Thane, Mumbai. 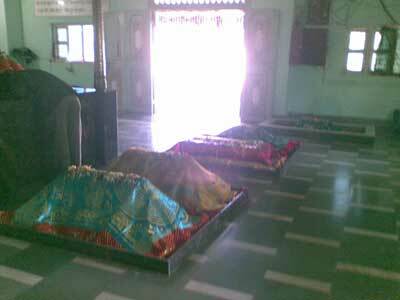 Hazrt Shahdad Shah Baba, Shahpur, Near Asangaon, Thane. in Bada Sonapur Kabrastan near Chari Road, Marine Lines station. 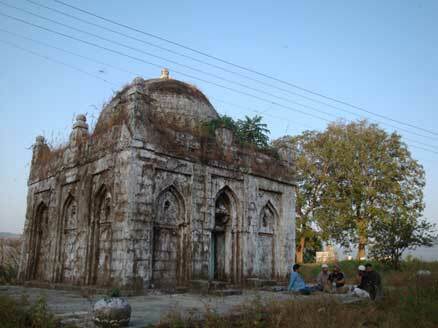 The Dargah of Pir Bala Shah is to the west of the town along Bid-Ahmadnagar Road, about 1.60 km. (a mile) away. It is in the centre of a courtyard with a parapet wall around. The tomb has no built roof above but is covered with a canopy of overhanging creepers. To the right there is the tomb of his mother, surmounted by a dome. Its walls bear lattice work. In the rear of the dargah there is a small mosque, with two domes crowning the top. To the left of it there are corridors. An annual urus is held in honour of the Pir. It is attended by about 4.000 persons. furlong (.201 km) away from the town is the dargah of Shahenshavali, built on an elevated ground which could be reached after climbing a flight of 23 steps. It is enclosed by an arched compound wall, an imposing gate with its top crowned by two minars serving as the entrance. The dargah, with a small mosque in its rear stands on a spacious plinth of 1.219 metres (4′) in height. On three sides of the plinth there are arches similar to those of the compound wall. The actual tomb has a double canopy-like structure the inner being smaller and supported on 4 pillars. The outer one enclosing the inner one is much bigger and has 12 pillars. The floor of the dargah is paved with coloured marble tiles having floral patterns. On the entrance gate is the old naubat-khana or the music gallery. The dargah has an inam of 242.81 hectares (600 acres) of land. In August an urus, attended by about 3,000 persons, is held. In the compound there are many tombs of unknown persons. At the bottom of the stairway leading to the dargah there is a well. Rajuri Masjid: The mosque is located near Rajuri darvaza, one of the entrance gates to the town and hence is called after the name of the gate. It was built during the life-time of Muhammad Shah Ghazi, in the year 1135 Hijri, The entrance to the mosque is on the eastern side. Its main hall is quite spacious and has two rows of pillars forming ten arches. Similarly, there are ten vaults, each in turn crowned with a small dome. There is also an outer hall which has been added recently. This dargah is located in BALAVLI village near PEN on MUMBAI-GOA highway road,Hazrat Peer Sayyed Baddruddin Hussaini baba’s Head is here at Pen Dist Raigad, The Body is at Paranda, Usmanabad. App 400 km From PEN shrine. You have to travel on Kaccha road for 7.5 km). Some mazars next to his roza. Main board at the entry of the mazar. Jinon ki masjid near Mazar of Hazrat Peer Sayyed Baddruddin Hussaini. 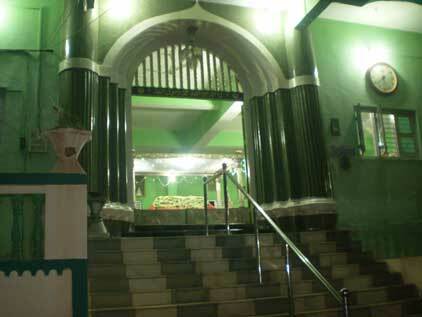 The Dargah of Khwaja Nizamuddin Auliya Aurangabadi (qutbe aftab qutbe deccan shaykul islam)(rahmatullah alayh) is situated at Shah Gunj Nizamuddin Auliya Road Aurangabad Maharasthra. Khwaja Nizamudeen Aurangabadi (rahmatullahi alaihi)’s birth and early history are somewhat vague, though it is known that he was a descendant of hazrat abu bakr as-siddiq (rahmatullahi alaihi), the first caliph of islam. his birthplace is thought to be kakor, india and it was there that he received his early education. to further his studies he travelled to delhi, the centre of learning at the time, and sought out a university. word of the popularity of hazrat shah kalimullah jahanabaadi (rahmatullahi alaihi) reached his ears, and he decided to meet the great saint. when he arrived at the seminary of shah kalimullah (rahmatullahi alaihi), he found the door locked, as the shaykh was engaged in the spiritual musical assembly of sama, to which outsiders were not permitted. unaware of this, he knocked at the door and, to the amazement of the other disciples, was welcomed in by shah kalimullah (rahmatullahi alaihi) and shown great love.soon after, he enrolled in the great saint’s university. initially, his primary aim was to obtain religious external knowledge only; but after a time the intense spiritual atmosphere that surrounded shah kalimullah (rahmatullahi alaihi) drew him closer to the path of the sufis. one day, as his shaykh prepared to leave, hazrat nizamudeen (rahmatullahi alaihi) came forward, dusted his murshid’s shoes, and placed them before him. upon seeing this, shah kalimullah (rahmatullahi alaihi) inquired, “o nizamudeen, have you come to acquire knowledge, or do you seek the path to allah?” to this hazrat nizamudeen (rahmatullahi alaihi) humbly replied, “you know better what is for me;you know better, for us, for me.”upon hearing these lines, shah kalimullah (rahmatullahi alaihi) recalled the prophecy of hazrat yahya madini (rahmatullahi alaihi) who stated that the one who would utter these words would be responsible for the spread and propagation of the chishtia silsila. hazrat nizamudeen (rahmatullahi alaihi)’s spiritual instruction began immediately. hazrat nizamudeen aurangabadi (rahmatullahi alaihi) was actively involved in the propagation of islam, and along with this he gave special attention to the spiritual training of his mureeds. historians have quoted the number of those disciples as being over one hundred thousand. at any given time after salaat, about 300-500 people would gather in his mosque for zikrullah. hazrat nizamudeen (rahmatullahi alaihi) was strict in his observance of the sunnah of the holy prophet (sallallahu alaihi wasallam) . his concern for the welfare of the community, as we have seen above, was sincere and very great. he would always ensure that in whatever way possible he would fulfil the need of anyone who shah kalimullah (rahmatullahi alaihi) him for assistance. the life of a saint is not only miracles and ecstasies; they live in the real world of ordinary mortals such as ourselves, but yet transcend it, for they breathe allah’s love with every breath. Hazrat was the king of YEMEN , Hazarat gave away the kingship and became a fakir on the command of our dear prophet.There are only 4 dhulas in the world. One of the nephew of khawza garib nawaz- hazrat life span was of 12 yrs. Hazrat was the most dearer Nearer to khawaja sabh. Apart from the name which was provided on the shrine and also the fact that the Hazrat is from both the Kadri and Chisti lineage, also provided on the sign board, not much is known of this shrine. It was very peaceful, clean and beautiful here. 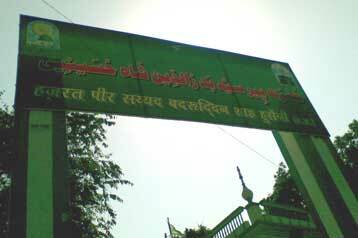 Chalishgaon – 90km frm Aurangabad-Hazrat PEER Musaqadri baba-Sandal on 17,18,19 of july. There is train from Mumbai. The Valley of Saints is located in Khuldabad, a town in the Aurangabad district of Maharashtra, India. Several Sufi saints of the Chishti order chose to reside in Khuldabad in the 14th century. The dargah of Moinuddin Chishti [Moinuddin Chishti is the name of a Chisti Sufi who was the preceptor of the Mughal Emperor, Aurangzeb. He shares the name of the Sufi Saint buried in Ajmer. ], and the tomb of the Mughal emperor Aurangzeb are located here. The valley also has the dargah of the Sufi saint Muntajib al-Din, known best by his epithet Zar Zari Zar Baksh, who migrated to this area in the 14th century at the request of his teacher, Nizamuddin Awliya of Delhi. Hazrath Ashraf Biabani (R.A.) was born on 2nd Ziqada 864 Hijri (i.e., 1478 A.D.). He completed his studies under the supervision and guidance of his father Hazrath Ziauddin Biabani (R.A.) and obtained ‘Khilafat’. He married Hazrath Maryam Bibi Saheba, the daughter of Hazrath Sang-de-sultan (R.A.). Hazrath Ashraf Biabani (R.A.) became the first sajjada Nasheen of the Biabani’s family. He used to pray and meditate in the forest of Faqrabad and Rauna prada in Jalna District, as his father did. A large number of devotees from far off places used to come to him for his blessings for whom he used to arrange mass meals (Langer). Hazrath Ashraf Biabani (R.A.) felt much pleasure at the arrival of the large number of guests and devotees. The people of surrounding area used to say “Ashraf Biabani Bhokey Ko Bhojan Piyasay Ko pani”. It means that Ashraf Biabani gives food to the hungry and water to the thirsty. Hazrath Ashraf Biabani (R.A.) died in 935 Hijri. 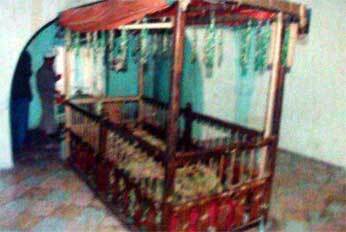 A devotee Mohammad Hussain constructed tomb on his grave according to the wish of Hazrath Ziauddin Biabani (R.A.). 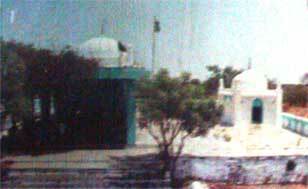 The tomb situated very near to the grave of Hazrath Ziauddin Biabani (R.A.) at Ambad Shareef. It is a unique sample of Deccan Architecture. The shape of the dome resembles the curved spikes of sweet melon. According to the ‘punch Gunj’ a neem tree was there very near to the dome. A branch of the tree bowed towards the dome. The leaves of the said branch were sweet like honey. The devotees would eat those leaves and became healthy. Hazrath Fazil Biabani (R.A.) ate those leaves till the age of 17. In the month of May, 1995 I (Syed Shujatullah) visited Ambad Shareef along with Hazrath Syed Shah Gulam Sarwar Biabani Saheb, the 7th sajjada Nasheen of Dargah shareef of Hazrath Afzal Biabani (R.A.) of Kazipet, in Warangal District (A.P.) and his nominated successor (Ja nasheen) Hazrath Syed Shah Gulam Afzal Biabani Saheb (Khusro pasha) to receive the blessings of the saints. We saw near the tomb a neem tree whose leaves are said to be sweet. So all of us ate and found them sweet. It is learnt that the king of Ahmed Nagar, Mohammad Shah III visited the place for his blessings. Hazrath Ashraf Biabani (R.A.) invited him for a feast along with his soldiers. The king accepted his invitation with respect. Hazrath ordered for 10 KGs of wheat flour and 10kgs of Mutton and cooked food in the night. Hazrath covered the bread and the vessel of curry with his rumal (towel). All the six thousand soldiers were served with the food, still one fourth of it was left and it was distributed among the disciples. It was great surprise to all of them. This miracle was nothing but the spiritual power of the saint. Hazrath Ashraf Biabani (R.A.) wrote a ‘Masnavi’ in the memory of Hazrath Syedna Imam Hussain Razi Allahu Taala Anhu and his fellow martyrs. It is called ‘Nausarhar’ (The first Shahadath Nama in Urdu in India). According to Hazrath Fazil Biabani (R.A.) in punch Gunj’, there happened a strange thing. 200 years after Hazrath Ashraf Biabani’s death, Hazrath Ameen Biabani and Mohammad Ahmed Biabani (R.A.) peeped into the grave through a hole and was astonished to find the coffin afresh. Further, they noticed that the right knee was in bent position. They also witnessed some mysterious light in the grave. The Dargah of Syed Shah Abdul Rehman Urf (Dum Bara Hazari Chistiya R. A.) is situated in Fakirwada Taluka-Ahmednagar Maharashtra. It is on Ahmednagar – Aurangabad Higway between Puna and Aurangabad. 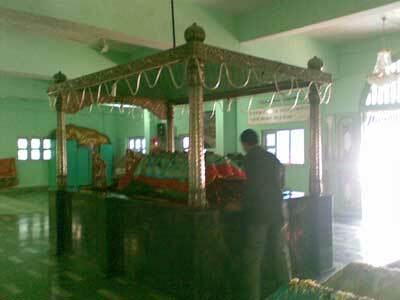 Dargah is more than 500 years old. Syed Shah Abdul Rehman Chisty was from the family of Khwaja Garib Nawaz Ajmeri, he was a very pious and religious person he took care of his niece KASAMSHAH from the age of 6 months and used to feed him milk from the small finger of his right hand. Lots of people visit the saints grave daily for supplications and once there supplications are answered they offer offerings in a small utensil owned by the saint which is now known as KISHTI (boat). Supplications for the marraige of Girls who are not getting married after reaching their due age are answerd very soon at this Dargah. Girls offer Green Bangles at the Dargah after their supplications have been answered. Once Aurangzeb was passing by Fakirwada with an army of 12000 soldiers, his army was very thirsty and hungary, they were starving sinced days. after hearing about the saint from the locals King Aurangzeb went to meet the saint and after offering his salams requested the saint to feed his army and the saint obliged. Hazrat had a small utensil of wood which today is known as a Kishti (boat) he covered the utensil with a cloth, read some ayats from the Quran and took a deep breath and by the will of God when he removed the cloth the utensil was filled with delicious cooked food which was more than enough for the army of Aurangzeb. Hazrat hold his breath till all the soldiers had eaten there food. Since than Hazrat is known as Baba Dum Barah Hazari. Aurangzeb was so happy with this miracle that he decided to donate 350 Acres of land to the saint but the saint refused he had no love for this worldly pleasures but Aurangzeb insisted and gave the Land to the small boy KASAMSHAH who was niece of Hazrat. The Deed of the Land donated by King Aurangzeb Stamped and signed by Himself is still preserved in the Dargah premises by the Family of KASAMSHAH Also in the Mazar there is a Quran written by Hazrat himself, his turban, clothes all are preseved in the Dargah premises even today, by looking at his belongings one could imagine how simple and pious person he was. Urs Sharif of the Dargah is on 14th ZullHajj according to arabic calendar. HAZRAT RAMAZANSHAN – Ahmednagar– Shagirdh of Hazarat NIZAMUDDIN SADATH DULHA .Hazarat RAMAZANSHAN was a NON -Muslim, till today popularly known amoung the non muslim as Kanifnath Maharaj. Kanif nath maharaj had a rath, & kanifnath maharaj used to travel in air, he had said who ever brings down my rath down i will take him as my ustad. It was the asar namaz time when Hazarat Sadath dulaha saw the rath in mid air & ordered the rath to come down,& it came down. Kanifnath maharaj fell in to Hazarat NIZAMUDDIN SADATH DULHAs feet & said i accept you my ustad, But Hazarat replied i dont accept any body as my shagirdh easily. River Godavari is just closeby. SADATH DULHAs gave kanifnath maharaj a raw mud container & asked get water from the river & fill the bigger container next to his dargha. kanifnath maharaj was trying to fill both the container for next 12yrs but couldn’t.